A long wait at a community health care clinic led to an international photography award for a Brazilian boy who is sponsored through ChildFund. In this award-winning photo taken by Brazilian teen Caio at a crowded local clinic, an elderly man in a wheelchair is examined in the hallway. 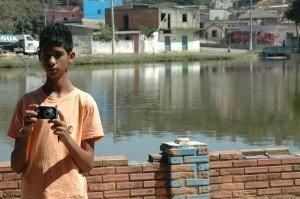 Caio, who is 15, participates in ChildFund Brasil’s project Photovoice, which provides cameras and photography training to youth. He submitted photos to a contest held by the World Health Organisation (WHO) last year that was open to teens from ages 14 to 19. Caio, 15, has learned about photography through the ChildFund-supported programme Photovoice. Caio’s photos were among 450 pictures produced by 77 teens in 33 countries. Five professional photographers, as well as a young doctor, chose the top 10 photos, and Caio was one of the teens selected. The other winners are from Argentina, India, Malawi, Pakistan, the Philippines, Slovenia, Ukraine and the United States. The teens, including Caio, won the opportunity to be contributing photographers for the WHO’s Health for the World’s Adolescents report. The photos, all related to health care and teens, will also become part of the WHO’s digital library and will be used in future publications, and each teen will receive a $1,000 stipend for their work. The Health for the World’s Adolescents report has been recently released – you can see Caio’s images here and here. We encourage you to read the whole report, which quotes teens from around the world about health concerns affecting their communities. In another photo submitted to the WHO contest, Caio captures the frustration on the faces of people waiting to see a doctor at a clinic. Caio’s been sponsored for 12 years, and besides the Photovoice project he participates in a computer course and sports activities held by ChildFund Brasil’s local partner organisation, Child’s Search for New Life – GCRIVA. 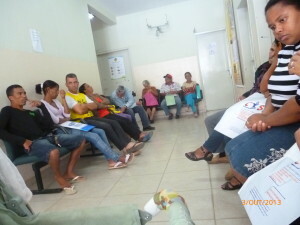 When Caio started going to ChildFund-supported programmes, he was a shy boy who had difficulty communicating and writing. But today he is becoming more confident and feeling more support. With the opportunity to speak out, he has developed better communication skills and interacts more with his peers. 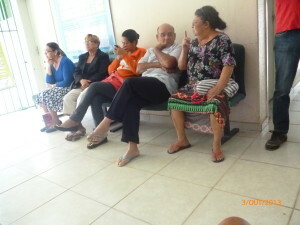 In this winning photo, some people waiting at the clinic begin talking loudly and making critical comments, according to Caio. Give another child the same opportunities that Caio is having in his life: sponsor today!